Anemia means lack of blood, is the state when the number of red blood cells, or the amount of hemoglobin (the oxygen-carrying protein) in red blood cells is below normal. Red blood cells contain hemoglobin that allows them to transport oxygen from the heart, which is obtained from the lungs, and then delivered to all parts of the body. 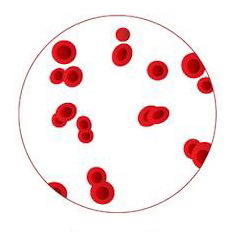 Anemia can be classified by shape, or morphology of red blood cells, the underlying etiology and clinical presentation. The most frequent cause of anemia is excessive bleeding, destruction of red blood cell hemolysis excess or deficiency of red blood cell production (ineffective hematopoiesis). What we will discuss in this article here is about anemia due to iron deficiency. Anemia due to iron deficiency, is a condition of nutritional deficiencies of iron which resulted in reduced red blood cell number. Anemia occurs when the body experiences a shortage of healthy red blood cells. Iron is needed by the body to produce red blood cell components known as hemoglobin. Hemoglobin in the red blood cells, is needed by the body to bind and carry oxygen from the lungs to all organs. It plays a role in the disposal of carbon dioxide from body cells in the lungs. If the human body is a shortage of red blood cells, the spread of oxygen and carbon dioxide disposal will be disrupted. This type of anemia is common in people of all ages, including children, with female patients, more than men. Most cases of anemia occurred in countries that are still developing. Iron deficiency anemia is one of the most common types of anemia. Appetite decreased. Especially if this condition occurs in infants or children. Blood tests can be performed to confirm the diagnosis of anemia. Blood tests can also show if there is a lack of iron or other substances required in the production of healthy red blood cells. See your doctor immediately if you experience symptoms such as the above. Ferritin is a protein that stores iron in the body. If the ferritin levels below normal, the supply of iron has been used, and there is not much iron is available again. Folate and vitamin B12 also plays a role in producing red blood cells to function properly. When the body having vitamin B12 and folate deficiency, anemia may occur. For female patients who experience excessive menstruation or menorrhagia, it is advisable to check the pelvic area to see if there are any signs of infection, or cause bleeding. This examination can be performed with ultrasound procedures. If you've confirmed you are suffering from iron deficiency anemia, you may be asked to undergo endoscopic and colonoscopy examination. Endoscopy is done to look at the source of bleeding in the esophagus and is also part of the stomach. While colonoscopy is performed to check the source of bleeding around the inner wall of the colon. The basic cause of iron deficiency anemia should be identified. This is done to prevent the re-emergence of this condition. If the anemia is left untreated and becomes chronic, complications can occur. For patients with iron deficiency anemia caused by lack of nutrition, you can consult with a nutritionist. They can assist in determining the menu of foods rich in iron intake. Dietary changes, both type and quantity, is very important in the treatment of anemia. We can add more iron rich foods like spinach, beef, and chicken livers. Women who are pregnant are advised to increase the intake of iron. Babies in the womb requires a blood supply and sufficient iron. The addition of iron can come from foods or iron supplements. Ask your gynecologist about the dosage, and the rules of use of supplements that you can consume. Foods rich in vitamin C also helps the absorption of iron. Foods rich in vitamin C are broccoli, oranges, kiwi, tomatoes and red peppers (read vitamin C foods article). Look for foods that are fortified, or complemented with iron. Iron supplements enhancer are most often recommended is iron sulfate. These supplements in tablet form and is usually taken two to three times a day. For heartburn sufferers, iron enhancer supplements should be taken two hours before or four hours after taking antacid medications. This is because the antacid drug can inhibit iron absorption. Patients who experience severe symptoms of iron deficiency anemia, and threatened his life, must be addressed with transfusions of red blood cells (RBC). Because, if handled with iron enhancer supplements the patient's body needs more time to absorb iron. Red blood cell transfusions may save the lives of patients with severe iron deficiency anemia. Treatment with iron supplements will be done once the condition of the patient is stable. There are several drugs that can interfere with the absorption of iron by the body such as antacids and proton pump inhibitor (PPI) that treat stomach ulcers, and digestive system. Those who take the drug on a regular basis over the long term, need to be aware of the side effects of gastric ulcers. Peptic ulcers, occurs when erosion or injury to the lining of the stomach wall. These sores can bleed slowly, so that eventually the body is deficient in red blood cells and iron stores. After some time, if left untreated, anemia occurs. Therefore, those who take the drug is recommended to consume them with foods, reduce alcohol consumption and smoking, as well as taking antacid medications. All these aim to prevent the formation of ulcers.